"Live my Life" - eine super spannende Angelegenheit. :-P Nach gefühlten 100 ähnlichen Produktionen kommt der Track reichlich spät.<br><br>Klaro zündet die Masche auf Partys u. die Beats sind sauber produziert. Aber es klingt sehr ähnlich, zu vielen Songs, der letzen Zeit. Aufgerundete 4*. 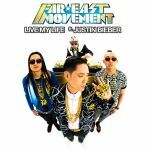 Two of my worst artists ever are in this (Far East Movement and LMFAO), and then there's Justin Bieber with a very unmemorable chorus to top it off.<br><br>This is crap at it's purest. The worst song of the year so far. Meine Güte, nimmt dieser überladene Autotune-Schrott denn auch mal ein Ende? Jetzt verzerrt man sogar schon Justin Biebers schnuckelige Bubi-Stimme, um letztendlich einen zu 100% an all dem angepassten Song zu produzieren, was derzeit in Billig-Clubs bis zum Hirntod runtergedödelt wird. Ich muss eindeutig öfter saufen, während ich Musik höre...<br><br>Soeben noch eine 2. How about that! Justin Bieber being good on a song for once!<br><br>JB is definitely the best part on this track, and apart from the occasional annoying FEM moment, this ain't half bad. Bisher das ganz klar schlechteste lied 2012.<br>Grauenhaft. Sounds alot like On The Floor. It's okay, but Bieber just has too ruin everything.<br><br>Okay apart from the JB part, it's okay. I'll bump it up too a 4.<br><br>OK, it's growing on me now, and JB doesn't sound too bad (he's actually done something good), so I'll give it a 5. The song starts with bad vocals and a very boring and uninspired chorus by Justin Bieber. Then it gets into Far East Movement's typical crappy rapping. Then it goes to that boring chorus again. Then it goes to another crappy verse. Then the chorus again. During this the beat is so bland, generic and boring. Then there's an instrumental section which is the best part of this song. Then it goes back to that horrid chorus. Thank goodness after that the song ends.<br><br>But oh wait there's more! There's a really bad Party Rock Remix which features Redfoo in it. There's even a different version of the film clip for it where the whole "party rocking" garbage is milked out yet again. This unnessecary Party Rock Remix makes the song a worse because it sounds like Redfoo is hungover while singing and just adds morr crap to this already crap song.<br><br>It's easily one of the worst songs of 2012 and it's Far East Movement's worst song. Yes, even worse than Like A G6.